Can I visit Mexico or Canada under automatic revalidation with B1 B2 visa? Sample FBI Police verification letter contains SSN last 4 digit, validity 12 months. Get by email as PDF file. 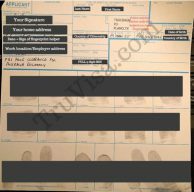 Validity of FBI Clearance Certificate for Canada is 6 months, Australia is 12 months from the date of issue. No expiry date mentioned on FBI Police Verification letter. Sample FD-258 Fingerprint Form - print on A4 white paper. Use black ink for taking fingerprints yourself or at US local Police station for use in FBI clearance. Sample one and same person affidavit for multiple names on education degree, passport and work experience letters. Use for Canada, Australia Visa or PR.